Can I install Python 3.x and 2.x on the same Windows computer? I'm running Windows and the shell/OS automatically runs Python based on the registry settings when you run a program on the command line. Will this break if I install a 2.x and 3.x version of Python on the same machine? I want to play with Python 3 while still being able to run 2.x scripts on the same machine. The official solution for coexistence seems to be the Python Launcher for Windows, PEP 397 which was included in Python 3.3.0. Installing the release dumps py.exe and pyw.exe launchers into %SYSTEMROOT% (C:\Windows) which is then associated with py and pyw scripts, respectively. In order to use the new launcher (without manually setting up your own associations to it), leave the "Register Extensions" option enabled. I'm not quite sure why, but on my machine it left Py 2.7 as the "default" (of the launcher). Running scripts by calling them directly from the command line will route them through the launcher and parse the shebang (if it exists). You can also explicitly call the launcher and use switches: py -3 mypy2script.py. You can have both installed. Same thing: in front of your script. Install both Python 2.7 and 3.4 with the windows installers. Now in command line you can use python for 2.7 and python3 for 3.4. From version 3.3 Python introduced Launcher for Windows utility https://docs.python.org/3/using/windows.html#python-launcher-for-windows. :: The @ symbol at the start turns off the prompt from displaying the command. :: The % represents an argument, while the * means all of them. Name them pythonX.Y.bat and put them somewhere in your PATH. Copy the file for the preferred minor version (i.e. the latest) to pythonX.bat. (E.g. copy python2.6.bat python2.bat.) Then you can use python2 file.py from anywhere. However, this doesn't help or even affect the Windows file association situation. For that you'll need a launcher program that reads the #! line, and then associate that with .py and .pyw files. # The directive must start with #! and contain ".exe". # found then the script will be run with 'python.exe'. # ie: whatever one is found on the path. 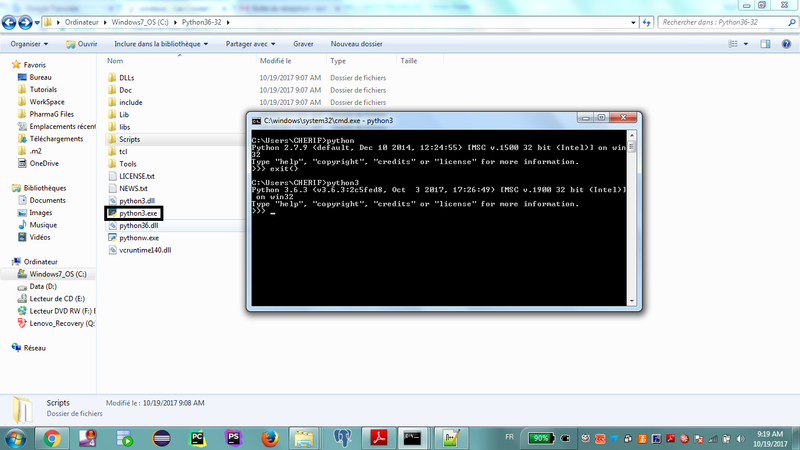 # on Windows using winpylaunch.py it uses C:\Python26\python.exe. # commandline and the use of winpylaunch.py will be transparent. interpreter = "python.exe" # Default to wherever it is found on the path. I've just knocked this up on reading this thread (because it's what I was needing too). I have Pythons 2.6.1 and 3.0.1 on both Ubuntu and Windows. If it doesn't work for you post fixes here. When you add both to environment variables there will a be a conflict because the two executable have the same name: python.exe. Just rename one of them. In my case I renamed it to python3.exe. Note: the same should be done with pip scripts. As far as I know Python runs off of the commandline using the PATH variable as opposed to a registry setting. So if you point to the correct version on your PATH you will use that. Remember to restart your command prompt to use the new PATH settings. The Python installation normally associates .py, .pyw and .pyc files with the Python interpreter. So you can run a Python script either by double-clicking it in Explorer or by typing its name in a command-line window (so no need to type python scriptname.py, just scriptname.py will do). People have been working on a Python launcher for Windows: a lightweight program associated with .py and .pyw files which would look for a "shebang" line (similar to Linux et al) on the first line, and launch Python 2.x or 3.x as required. See "A Python Launcher for Windows" blog post for details. Before I courageously installed both simultaneously, I had so many questions. If I give python will it go to py3 when i want py2? pip/virtualenv will happen under py2/3? It seems to be very simple now. Just blindly install both of them. Make sure you get the right type(x64/x32). While/after installing make sure you add to the path to your environment variables. Replace the x in the command above to set the path. Then go to both the folders. and rename pip to pip3. You can similarly do the same to python file and others. I think there is an option to setup the windows file association for .py files in the installer. Uncheck it and you should be fine. If not, you can easily re-associate .py files with the previous version. The simplest way is to right click on a .py file, select "open with" / "choose program". On the dialog that appears, select or browse to the version of python you want to use by default, and check the "always use this program to open this kind of file" checkbox. You should make sure that the PATH environment variable doesn't contain both python.exe files ( add the one you're currently using to run scripts on a day to day basis ) , or do as Kniht suggested with the batch files . Aside from that , I don't see why not . P.S : I have 2.6 installed as my "primary" python and 3.0 as my "play" python . The 2.6 is included in the PATH . Everything works fine . I would assume so, I have Python 2.4, 2.5 and 2.6 installed side-by-side on the same computer. Simple, python 3.x download comes with python for windows app. SO simply pin the Python for Windows app to your task bar, or create shortcut to the desktop and you are done! Hmm..I did this right now by just downloading Python 3.6.5 for Windows at https://www.python.org/downloads/release/python-365/ and made sure that the launcher would be installed. Then, I followed the instructions for using python 2 and python 3. Restart the command prompt and then use py -2.7 to use Python 2 and py or py -3.6 to use Python 3. You can also use pip2 for Python 2's pip and pip for Python 3's pip. Not the answer you're looking for? Browse other questions tagged python windows python-3.x compatibility or ask your own question. How to I get Python 2.x and 3.x to co-exist? How can I install Python 3x and 2x into same machine? Python: will having python 2 and python 3 casues trouble? Can you run both python 2 and python 3? Is it ok having both Anacondas 2.7 and 3.5 installed in the same time? Is it possible to install python 3 and 2.6 on same PC?